MOD FUN is a current band with a vast history that can be traced back to their 80's Garage/Mod/Cavestomp/Paisley Underground origins. The trio formed in 1983, released some vinyl, toured the USA twice, Europe once, and then abruptly disbanded (for about 17 years!) in 1987. To mark the release of their debut single (released in 1984,) MOD FUN's original lineup made a highly successful and well attended return to the stage for a"20th Anniversary Reunion Gig." This was originally set to be a "one time" event, however, in the 5-some years since then; Mick, Chris & Bob have had their Get Hip Records 20-song best of ("Past... Forward") cd re-issued, and released a 20-song new double-album ("Now... And Again"), and performed live in over a dozen cities, including: Annapolis, Atlantic City, Chicago, Long Branch, Nashville, New Brunswick and Philadelphia; along with multiple stops in Asbury Park, Baltimore and NYC... MOD FUN has also recorded cover versions of Moving Sidewalks, Birds, Squire and Yardbirds tracks appearing on 3 Mod/Garage Comps, which were released in the UK, USA and Greece - all these recordings were done at Mick's DAMn!studios in Ocean Grove. And now to kick off "twenty ten," the trio has finished the 15 new tracks that make up "Futurepresent." Past Forward: in 1983, (as highschoolers) the lads heard "This is the Modern World" by The Jam for the first time & their "new wave" suburban North Jersey life would never quite be the same (listening to Police, Pistols and other "IRS" bands.) In true teenage spirit, they dubbed themselves "Mod Fun" and (unconsciously ?) set out to emulate The Jam so well that after sending their first demo tape over to him in England, Paul Weller wrote back that it was "All too close to the Jam for (his) tastes, but quite flattering , actually" !!! Luckily the band went on to become influenced by most of Weller's own influences, as well (The Creation, Small Faces, and especially The Action) and beyond: (Syd's Pink Floyd, The Eyes, Wimple Winch, and American Garage ala the Nuggets & Pebbles collections; ) always with one eye peeking at American indie pop like The Bongos, The dB's (who's Chris Stamey they opened for - MF even covering "Dynomite"), and Alex Chilton, Game Theory & The Salvation Army / Three O'Clock. 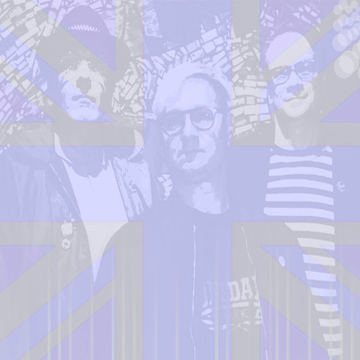 Mod Fun released 2 Singles ("I Am With You" and "Mary Goes Round"), 1 EP ("Hanging Round" co-produced by Ron Rimsite of 99th Floor Fanzine fame,) and 2 Albums ("Dorothy's Dream" with Dave Amels of The Stepford Husbands and "90 Wardour Street" on Midnight Records) befour calling it quits in 1987 after a turbulent European tour that brought them thru Switzerland, Germany (2x! ), Italy, and Austria. Michael Quercio (3'Oclock), Thurston Moore (Sonic Youth), Richard Barone (Bongos) and Jello Biafria (who sent the band not one, but two post cards seeking out their 7-inch 45's to "complete his collection,") were all fans of the band... Quercio showed up at the band's lightly attended Madame Wong's LA show... Moore ran into Mick and Jim Testa (Jersey Beat Fanzine) outside SNAFU in NYC and after a brief introduction by Jim, commented: "Ahhh Mod Fun, I like the vocals on there a lot"... (based on his just having picked-up the single "I Am With You" early in1984)... Barone was actually "slated" to produce MF at one point, when they were being "courted" by Hoboken-based Coyote Records. Although they toured the US three times (out to California and back,) The Mod Fun became mostly well known as the only mod-pop band based in the NYC garage revival of the early / mid -'80s (until the x-cellent and MF inspired Secret Service appeared). Other modish bands started to pop-up near the end of Mod Fun's near residence at The Dive (aka "Cavestomp Central"); but none seemed to even get the chance to quite immerse themselves in that scene and genre in the way MF did as The Dive sadly closed down at it's height of popularity. After The Dive closed, a gig with the amazing NY act The Vipers at the legendary Peppermint Lounge was soon followed by a few sold-out headlining shows at Maxwells. The CD collection "Past Forward" released by GET HIP in 1995 was reissued in 2004 and it encompasses most of their 80's recorded output including some UK-only tracks that first appeared on Hi Lo Records LP "American Heart and Soul" and were remixed in '95 for their debut on cd. Also included on the 20-track collection is unreleased material produced by legendary rock scribe Jim DeRogatis and many vinyl-only tracks from Mod Fun's three 7-inchers & two 12-inchers released back in the day. Cover versions include tracks by The Zombies, The Kinks and The Syn, although singer-songwriter Mick London also had quite a knack for making his original material "strangely reminiscent" of many popular Mod/Psyche-pop Anthems. Stay tuned - same Bat-time, same Bat-channel !!! more bio info ALWAYS coming soon!! check out the "disco" page to order the cds!